FPInnovations unveiled its new Steep Slope Initiative at the recent Safety by Design Symposium held in May in Vancouver, B.C. The symposium was organized by WorkSafeBC and the Association of Canadian Ergonomists. The new Steep Slope Initiative is a multi-year program to improve access to timber on slopes. It will expand FPInnovations’ steep slope related work, and its focus is on technology and innovation for maximum safety and minimal environmental impact. FPInnovations researcher Brian Boswell gave a presentation on the current developments in FPInnovations’ Steep Slope Harvesting Research Program and presented results from recent machine stability tests. The machine stability tests compared the stability of tilting and non-tilting feller-bunchers for working on slopes. The results showed that the tilting machine’s stability on a 50 per cent slope was equal or better than the non-tilting machine’s stability was on a 40 per cent slope. FPInnovations’ steep slopes harvesting research program helps its members improve safety and reduce costs when operating on the steeper terrain common to many areas in British Columbia. Current research topics include development and validation of a static stability testing protocol, evaluation of a tilt-cab loader-forwarder, linkage of LiDAR-based ground mapping to as-experienced machine inclination, and the application of six-wheel skidding systems to steep slopes. Future projects will extend the learnings from the recent feller bunchers tilt-table testing into real-world application. For more information, please contact Brian Boswell at brian.boswell@fpinnovations.ca or (604) 222-5734. Canada’s forested landscapes feature numerous wetlands, such as fens, bogs and swamps, which present environmental and operational challenges during the planning, construction and maintenance of resource roads. An update on the performance of geogrid for foundation improvement on small culverts. 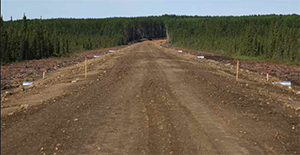 A profile of the construction techniques used for an all-season access road in Alberta. An update on proposed design concepts for improving foundations for small culverts. Proposed wetland best practices for crossings across wetlands with stagnant, lateral and fluctuating subsurface flows. FPInnovations is now focused on bringing together the knowledge gained in recent years in the development of a national field guide to aid in the planning, construction and maintenance of resource roads across wetlands. This work will begin in the summer of 2014 and plans are to have the field guide available by late 2015. In support of this work, FPInnovations recently received a Sustainable Forestry Initiative Conservation Grant to aid in the development of this national field guide (http://www.sfiprogram.org/media-resources/news/sfi-invests-in-forest-conservation-research/). The submission for this funding opportunity was supported by many project partners including FPInnovations members J.D. 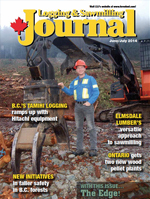 Irving Ltd., Resolute Forest Products, Weyerhaeuser and the Ontario Ministry of Natural Resources. In addition to the development of the field guide, FPInnovations will continue to support the monitoring of ongoing study sites, as well as the establishment of possible new study sites. For further information on research efforts by FPInnovations on resource roads and wetlands, to propose new research study opportunities, or to discuss applications of this work in your operations, please contact Mark Partington at mark.partington@fpinnovations.ca / 514-782-4525 or Clayton Gillies at clayton.gillies@fpinnovations.ca / 604-222-5674. 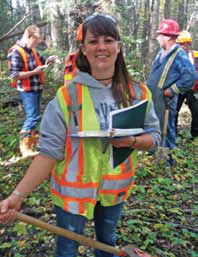 By tapping into a portion of the stumpage fees collected from Alberta forest companies, the Woodlands Operations Learning Foundation (WOLF) is providing an invaluable service to Alberta’s forestry sector by providing training and learning resources to produce a pool of well qualified potential employees, and more knowledgeable current employees. 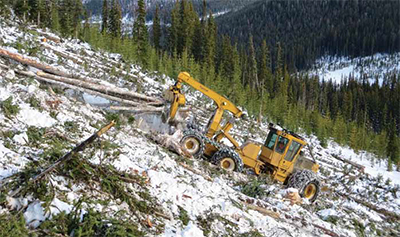 Forest Resource Improvement Program (FRIP) fees are collected from industry by the Forest Resource Improvement Association of Alberta (FRIAA). It consists of over 30 forest industry members, including all the major Forest Management Agreement holders, as well as quota holders and smaller operations. FRIAA has been delegated responsibilities—by the Minister of Environment and Sustainable Resource Development (ESRD)—to promote and initiate projects that enhance Alberta’s forest resources using the FRIP funds. In addition to FRIP, the association also manages the Community Reforestation Program, the Mountain Pine Beetle Program, the Mountain Pine Beetle Forest Rehabilitation Program, the Wildfire Reclamation Program, and the FireSmart Program. Since 2005, FRIAA has provided WOLF with over $1 million in FRIP funds to provide learning resources and program delivery in the areas of pre-employment programs that introduce and promote forestry as a career choice. It also provides continuing education in forest resource and environmental management for the industry’s existing workers, which helps industry retain workers. “FRIAA is a very big player in our world,” says Dave Blackmore, WOLF executive director, adding that its financial support has been crucial to helping to sustain the foundation’s learning resource development and delivery over the years. He adds that through FRIP-supported programs such as EDWood, Forest Resource Environmental Education (FREE), and the Public Involvement, Education and Awareness Project (PIEAP), WOLF has provided over 5,000 days of student training as well as built and maintained 20 one-day courses. Though FRIAA paid the tuition for these courses through WOLF, the cost of the time and travel for the students is a better reflection of how much these courses are valued by the subscribers. Todd Nash, FRIAA general manager, says the association is very pleased with the partnership it has developed with WOLF, emphasizing that the industry as a whole benefits from this relationship as the financial support for the training programs developed and delivered by WOLF is for the overall benefit of the industry. Supporting WOLF allows FRIAA to fulfill its mandate to help the public improve its understanding and management of forest resources. He adds that FRIAA appreciates that WOLF’s learning resources appeal to both young people deciding on a career as well as more experienced individuals perhaps wanting to upgrade their knowledge and skills. Overall, WOLF has developed and can offer over 45 training programs. Among these are Woodland Harvest Block & Road Layout; Woodland Water Quality, Erosion Control & Crossing Construction; Woodland Stewardship; Woodland Road Construction; an Introduction to Equipment Maintenance and Service; a Log and Fibre Haul Professional Driver Improvement Course; and Woodland Contract Management. Most courses can be delivered either online or face-to-face. A complete listing of programs is available on the WOLF website (https://www.w-o-l-f.ca). FRIAA supports only those programs related to environmental protection and awareness, as well as forest management practices. New courses developed directly as a result of FRIP financial support are Careers in Forest Management (including a list of Alberta forest education institutions’ programs); An Introduction to Forest Management; Integrated Land Management Principles (cumulative effects, tools and strategies, and public engagement); Species at Risk; and, Archeological Resources. Curriculum design and maintenance is managed by WOLF’s Curriculum Design Committee, which consists of a group of experienced forest managers. For more information about WOLF, and its resource-related curriculum and services, see the website, www.w-o-l-f.ca, and for more information about FRIAA, visit their website at www.friaa.ab.ca. Wood-based polymers may soon have widespread use in automotive components but it’s their potential as a replacement building material for packaging products like wood pallets that has Alberta Innovates Bio Solutions (AI Bio) excited for local forest product manufacturers. William Harney (left), Executive Director for Research and Development at Magna Exteriors and Interiors, speaks to the large audience at AI Bio’s Impact Innovation 2014 event held recently in Edmonton. That’s why AI Bio has agreed to invest a further $500,000 to support Phase II of a research project in addition to the $600,000 it has already invested to investigate the industrial applications of wood-based polymers not only in the auto industry, but also in other industries. Also supporting this research are auto component manufacturer Magna Exteriors and Interiors Corp., the Centre for Research & Innovation in the Bio-Economy (CRIBE) and the Ontario Bio-Auto Council (OBAC). Magna Exteriors and Interiors Corp. is part of automotive supplier giant Magna International which has sales in the billions and 315 manufacturing operations around the world. William Harney, Executive Director of Research and Development at Magna Exteriors and Interiors, brought those attending AI Bio’s highly successful Impact Innovation 2014 seminar—held recently in Edmonton—up to date on the findings of the project’s Phase I. Impact Innovation is an annual event hosted by AI Bio that provides industry and the public with updates on some of the most exciting research supported financially by AI Bio. During his presentation entitled, “Innovation in Automotive Biocomposites”, Harney said that “we’re trying to go right from the forest industry to car parts” as it relates to the development and commercial application of wood-based polymers. In addition to feeling pressure globally to develop automotive components that are more environmentally-friendly, companies like Magna are also feeling pressure from its customers to help them meet regulations related to fuel economy. In North America, new vehicles must comply with the Corporate Average Fuel Economy (CAFE) mandate for a 54.5 miles per gallon fleet average by 2025. 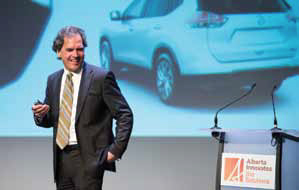 While working to help its customers meet that standard, Harney said that auto component manufacturers are challenged because big petrochemical companies that supply petrochemical-based polymers to the auto industry don’t see their issues as a priority since the auto industry represents only about one per cent of their total business. So as an alternative, companies like Magna have turned their attention to the potential use of wood-based polymers in auto components. Based on the findings of Phase I of potential industrial applications of wood-based polymers, they have good reason to feel optimistic. According to a report delivered by Magna to AI Bio at the recent conclusion of Phase I, wood fibre offers two very significant advantages over the use of standard E-glass fibres. One is that wood-based polymers are about 40 per cent lighter and the second is that wood-based polymers are about 50 per cent cheaper. Four Alberta forest products companies participated in Phase I of this project to test the use of their wood fibres to produce wood-based polymers for industrial applications. Steve Price, AI Bio Executive Director for Advancing the Bio-Economy, says the findings from Phase I are very encouraging and he senses a strong desire among the research partners to accelerate the production of wood-based polymers in high volumes and at commercial scale for use in the auto industry. However, the reality for Alberta’s forest companies is that the automotive industry is based in central Canada, making the shipment of the raw material from the West more expensive than forest industry suppliers closer to the automotive industry. He believes the lower hanging fruit for Alberta’s forest industry is to potentially embrace the production of wood-based polymers in-house with the goal of supplying other industries like pallet manufacturers. William Harney (above), Executive Director for Research and Development at Magna Exteriors and Interiors, speaks to the large audience at AI Bio’s Impact Innovation 2014 event held recently in Edmonton. 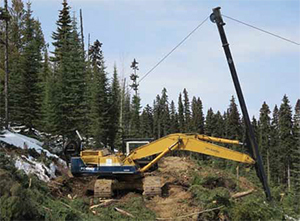 Developed in Québec during the 1980s, the Teleforest cable yarding system has been used successfully in eastern Canada, and in other countries. However, it had never been tried in British Columbia until a logging contractor purchased and started yarding with the Teleforest in the fall of 2013. FPInnovations recently observed the Teleforest operating near Quesnel in the B.C. Interior. The main components of the system were two excavators and two yarding towers supporting a standing skyline and a self-propelled (motor-driven) radio-controlled carriage. A yarding tower was installed on the stick of each excavator. Skyline tension was controlled by a winch installed on the excavator’s tail. Two choker-setters and a landing worker set and released chokers, controlled the carriage through handheld radios, and moved the towers. Starting a new yarding corridor was fast and simple as it only required partially lowering the skyline and moving the towers. The contractor estimated the yarding productivity at the site was 170–200 m3 in a nine-hour shift. Average stem size was approximately 0.7–0.9 m3. Carriage fuel consumption was estimated at 30 litres per day.The Teleforest system is sold as a complete unit for $450,000 which includes two used excavators for the yarding towers. The contractor using the Teleforestsystem thought that it worked well and was satisfied with its performance. For more information, visit the TeleforestWeb site. Rather than spewing mulch on the ground, the Gyro-Trac BBS system gathers it and compresses it into a round bale ready for shipment. Mulching and vegetation control contractors, equipment dealers, forestry representatives, government representatives, and scientists were recently treated to the first of a series of biomass harvesting and collection system demonstrations hosted by the Canadian Wood Fibre Centre (CWFC). The first demonstration was the patent-pending, Gyro-Trac Bio-Energy Biomass System (BBS) all-in-one wood fibre mulching and baling system. Tim Keddy, CWFC Wood Fibre Development Specialist, says the demonstrations of the Gyro-Trac BBS system—conducted at various locations from Ontario to Alberta—were meant to introduce individuals to the type of biomass harvesting and collection systems that are available. Three other systems, the Fecon Bio-Harvester, the AAFC biomass harvester prototype and the Anderson Bio-Baler, will also be demonstrated at various locations throughout Canada this summer. These demonstrations are part of CWFC’s program to develop and evaluate different mid-supply chain options for harvesting and delivery of woody biomass in Canada. “We’re showing what different options are available at demonstrations throughout Canada and hoping that industry will find a system that works for them and begin to apply it commercially,” Keddy said to the group gathered at a demonstration held at the University of Alberta Ellerslie Research Station in Edmonton. Wayne Gradwell, Brushing Supervisor with ACE Vegetative Service, says they already use a Gyro-Trac mulcher in their business. The company’s interest in attending the demonstration of the Gyro-Trac BBS system was to investigate how the unit collected, processed and packaged the material once it was mulched. He adds that the equipment did work as advertised, with the only caveat being that he would like to see a bit more speed in the production of each round bale. However, he says if ACE Vegetation Service is able to earn $50 from the sale of each 800 - 1000 kilogram bale, then it would make the effort financially worthwhile. While the technology works, he says it still remains to be seen where markets can be developed for the bales once they are produced. The Gyro-Trac head office is located in Summerville, South Carolina, although the technology was developed in Quebec. The company has five units that have been working in Florida for about a year. It was the crew from the company operating the equipment in Florida, Oliver’s Bush Hogging, who toured with the Gyro-Trac 270 HP BBS unit across Canada; they had experience working with the equipment in a commercial application and could answer questions from demonstration attendees. Gyro-Trac also produces a 350 HP BBS system. The prime mover and baling unit can be purchased as a package or separately. 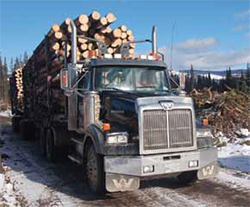 The unit was put to work in a variety of environments during its tour, processing both hardwood and softwood as well as wood infected with the mountain pine beetle. What’s different about the Gyro-Trac BBS system vs. its standard mulcher is that the cutting head shoots the mulch to a conveyor, instead of on to the ground. 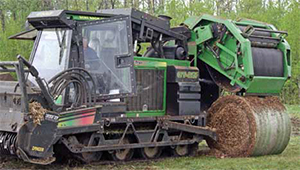 The conveyed mulch is processed through a chipper that further reduces the material to between 3” and 4” in diameter before it collects in the BBS tensioning and compacting round baling unit. The system can process any size diameter wood and in fact works most productively on larger logs and trees because it can process more wood fibre and create more bales without moving. Each unit requires about one hour of maintenance per shift, and in Florida they were able to produce one bale every six minutes on average. Because the mulch is compacted into 800 - 1000 kilogram bales, it adds about 30 per cent more capacity per load when transported vs. non-baled mulch. For more information about the Gyro-Trac BBS, check out www.gyrotrac.com. A huge amount of wood waste in various forms shows up at Alberta landfills every day. But Alberta Agriculture and Rural Development has partnered with the Alberta Wood Waste Recycling Association (AWWRA) to help landfill operators understand the potential this wood resource has to generate new income or cost savings for both municipalities and private landfill operators. For example, it can be processed into landscaping materials or into fuel for bio-energy production. There is also the potential for landfills to collect additional tipping fees by accepting more wood waste for conversion into these products. Toso Bozic, Agroforester with Alberta Agriculture and Rural Development, says the Alberta government wants municipalities in particular to consider developing bio-energy systems where processing the vast amount of wood waste they collect within their landfills could become the hub for these systems. Local farmers could also benefit by growing and marketing woody biomass to a municipality to supplement any shortfalls that municipalities could experience from processing their landfilled wood waste. They could also partner with the municipality as bio-energy investors. While many municipalities and landfill managers are keen to make better use of the high volume of wood waste left on their doorsteps, Bozic says the question is how to develop a total and economically viable bio-energy project from raw material to the production of heat or electricity. That’s where AWWRA fits into the picture, as a resource to work with individual municipalities and landfill owners to develop their renewable wood waste and biomass waste management systems. Its membership includes municipalities, consultants, and related industry suppliers. Alberta Agriculture and the AWWRA recently collaborated with the Athabasca Regional Waste Management Services Commission to hold a one-day wood waste and biomass waste management workshop engagement event. The focus of the event was to identify business opportunities and constraints for recycling and re-using wood waste and biomass materials in Athabasca County, about 150 kilometres north of Edmonton. Jim Donaldson, Chairman/Founder of AWWRA, created the association about three years ago; he recognized that many Alberta municipalities do a good job managing landfills and their accompanying transfer stations. But he believes that with the right kind of assistance and some capital expenditure that municipalities and private landfill operators can develop methods to sort and process their wood waste materials and biomass, so it could be used to generate new sources of income. 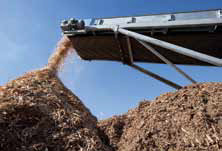 Not all landfilled wood waste and biomass can be used as bio-waste to energy fuel. Part of AWWRA’s education resource service is to help landfill operators identify what are acceptable wood and biomass waste materials for potential reuse. Acceptable wood wastes are trees and branches, pallets, crates, rig mats, small and large wooden cable spools, mill wood residue, sawdust, plywood, wood furniture and lumber. Unacceptable materials are creosote treated wood products, painted wood, and creosote utility poles. Most landfills already have some method of material sorting. What would be required is to take current methods of wood waste sorting a step further to set aside acceptable materials from unacceptable materials, for possible daily reuse in bio-waste to energy production at both transfer sites and primary landfill locations. “Making use of wood waste and biomass in this way is do-able, environmentally sound and economically viable,” says Donaldson. The reason is simple: if landfill operators fill up their landfills with these reusable materials, then they will run out of landfill space. In terms of financial support for developing potential wood waste and biomass management systems, Bozic says that the Government of Canada has endowed the Federation of Canadian Municipalities with $550 million to create the Green Municipal Fund (GMF). It offers funding and knowledge to municipal governments and their partners for municipal environmental projects. Alberta has a well established pulp and paper industry with the main commodity being wood pulp. But what about the commercial potential of other valuable parts of the tree, such as lignin and cellulose nanocrystals (CNC) extracted as part of the kraft pulping process? AITF can produce high value cellulose nanocrystals (CNC) from wood fibre at a rateof up to 100 kilograms per week. Alberta Innovates Technology Futures (AITF) has established two leading edge research programs that include both the technical expertise and equipment to pursue commercial applications for lignin and CNC. It welcomes both industry and research partners anywhere in the world who want to find new uses and markets for these valuable commodities. Keith Luo is the lead research scientist in AITF’s lignin research area and Frank Tosto is the senior technologist engaged in operating and promoting AITF’s CNC production and research capabilities. AITF operates one of the world’s few high volume CNC pilot plants, capable of producing up to 100 kilograms of CNC per week. 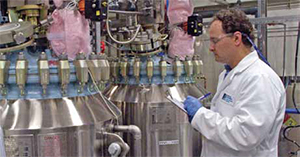 The Alberta plant is unique in that it can provide CNC as a spray-dried material. CNC is well documented as having huge potential as both a product enhancement and a more environmentally friendly alternative to inorganic nanomaterials. Its future commercial use could have the same type of impact that carbon fibres and titanium had as enhancements for many commercial products. Liyan Zhao, a research scientist who has been working on the AITF program related to CNC since it began in 2008, says while CNC as a material has been known for some time, Canada has only recently pioneered methods to produce it in large quantities. For the Canadian forest industry, CNC is a high value, marketable bio-product that can be manufactured by the pulp and paper sector. CNC has been shown as having potential commercial applications in paints, industrial coatings, automotive components, building materials, plastics and packaging. Tosto says the key is not to push CNC as a commodity into the market at present, but to work with end users to develop markets, which will then pull production from the forest sector. AITF also has a relatively new extraction, purification, characterization, and modification research program related to lignin, established as part of the Government of Alberta’s lignin strategy. It has the equipment to consistently extract lignin with a purity of up to 99 per cent from black liquor at a rate of one kilogram per day as well as research tools to investigate and evaluate economical methods to convert lignin into high value, designer chemical compounds. Lignin can comprise up to 25 per cent of woody biomass, and currently is primarily burned with the black liquor mixture at most Canadian kraft pulp mills. AITF researchers are working with industry partners to develop economical methods to give lignin extracted from the kraft pulping process water solubility properties as well as investigating ways that it can be converted into an environmentally friendly resin replacement for oriented strandboard production. The AITF lab location of this research is well-situated since AITF also has a panelboard pilot plant located in the same facility to test and demonstrate these lignin-based resins. Luo adds that there is a direct relationship between the volume of black liquor produced and burned by a pulp mill and its pulp mill production capacity. If pulp mills precipitate lignin from their black liquor and develop marketable products from it, this will also improve the mill’s pulp production potential. Both Luo and Tosto say that a primary focus they have regarding potential downstream use of both these commodities is within the oil and gas sector, given Alberta’s prominence as a petroleum producer. They are working actively with the petroleum research and development group at AITF to develop, for example, a lignin product as a flotation aid to enhance bitumen recovery and CNC use in the production of more environmentally friendly drilling muds and fracking fluids with enhanced performance attributes based on CNC’s properties. AITF can produce high value cellulose nanocrystals (CNC) from wood fibre at a rate of up to 100 kilograms per week. For more information about AITF’s CNC and lignin research programs and capabilities, contact Frank Tosto at (780) 450-4617 or frank.tosto@albertainnovates.ca, and Keith Luo at (780) 450-5265 or keith.luo@albertainnovates.ca.